I have always disliked “bribing” my players. 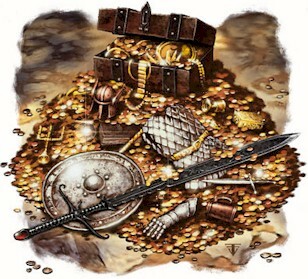 Background write ups, treasure wish-lists, and other issues some DM laments that his players don’t contribute enough of it and inevitably someone replies with a suggestion to bribe the player with experience, items, gold, bonuses, action points, or whatever else seems applicable. It’s not usually my cup of tea. I’ve never relied on it and if a player wasn’t doing enough of something I just focused on encouraging more of it or else let it drop entirely. Well, I’m bringing this up because of a recent change of heart: I decided to bribe my players. The problem that had been plaguing me for several months was the lack of players participating or contributing to our campaign’s wiki and forum over on Obsidian Portal. I begged players to discuss topics or help update the journal and the wiki and I received less-than-lackluster results. I knew the ability to contribute existed among them (time, access, etc) but only one or two players participated on a semi-regular basis. I decided to attempt bribery but I didn’t want to offer XP; our group leveled up less by XP and more by the number of sessions completed. The game was set in Dark Sun, so I couldn’t offer magic items without risking making magic items less special and I couldn’t balance holding back items if it meant less participation. Money was nice, but again I didn’t want them to have excessive wealth in the gritty world of Dark Sun. Eventually I had an idea, one that wouldn’t disrupt the delicate balance of wealth in Dark Sun. I announced to the group that they would be rewarded for their participation on Obsidian Portal with money – but that money would never appear in-game. I explained that every post, every wiki page, every bit of participation had a specific value and that amount would be added to an out-of-game fund everytime they contributed. This savings account of gold pieces can be spent, but only with the consent of everyone in the group. I agreed that any item they voted to purchase, I would work it into the next session – probably as part of the next treasure bundle in the game if it was mundane enough. In this way I could reward the players, prod them into choosing their own reward, and balance my other treasure rewards. For interesting items I might bring them in with plot hooks attached. Ideally, the group could save the money and use it to purchase items they would not have otherwise recieved in-game. One example I mentioned to them would be getting the entire group matching magic tattoos. The group liked the idea and agreed to persue it. It did stimulate activity on Obsidian Portal and I made sure to keep the balance updated and notified everyone in the group every time someone contributed. The group is currently taking a break from Dark Sun. They haven’t redeemed their money for any items yet, but when we do return to playing I intend to continue this plan and see how it develops. Additionally, I have another D&D group just getting started and I’m planning on implementing the same reward system, although with an adjusted rate of reward to see if it garners more interest. If anyone else uses Obsidian Portal, I’d love to here how much your players participate and if you reward or encourage them to do so more often. If you decide to implement a plan like this one, I’d also love to hear how it turns out! I’ve tried obsidian portal too. Its very nice but it just didn’t grab my players. I then switched to Epic Words and for some reason they participated more readily. I’m not sure why. Perhaps its a bit less intimidating. Perhaps its because the RSVP system for building your game calender with automatic notifications of game nights and who has committed and who hasn’t was like a forced participation(I think OP has this feature now but its not free). Anyway, I had a much improved participation from the start on EW but I wanted to make it more interesting so I started offering in-game bonuses for contributions. Basically, if you posted in-character on Epic Words, just maybe a paragraph, what your character is thinking or feeling at that stage of the adventure, you’d get a +1 bonus to anything you attempt next session. If the contribution is particularly poignant, interesting and inspiring, you’d get 2 x or even 3 x +1 tokens. I actually made tokens with the RPTools Token Builder that say +1 on them and I hand them out at the beginning of each session. This does a couple of things. It rewards my players for interesting contributions and it furthers the story of the game in a direction of their choosing. Ultimately, it informs me as the DM of what they want, like, or don’t like in the game. This is a win-win for sure. The other cool thing about Epic Words and maybe OP does this too is that all contributions can be linked to a specific play session. So when you go back and look at your gaming calendar, you can look at a certain session and see what comments were made by whom during that session week. It also links your experience and loot to each session so you can see a really nice breakdown of who was met/killed/saved/EXP/Loot/comments for each session. Having this all linked was really a feature that got my players hooked. Seriously? How’d you get in my head? I’m currently running a Dark Sun using Epic Words as our wiki. Of my 6 players only 4 have registered, Those 4 all put up character histories, though of those 4 only weren’t vague and non-comittal. And of those 2 only 1 has been updating the wiki with places and organisationms from her bckground. If I was running something short I wouldn’t mind but since this is supposed a long term campaign I would like a certain amount of buyin from players. If they invest in the ganme its easier for me include their characters in the meta-plot. I recently toyed with the idea of bribing for participation, but since it’s also DS with fixed levelling I’m stumped. Will be interested to see your notes if you have any costs or something typed up. Pls excuse spelling, typed on BB on bumnpy road. @mike : I LIKE that. I had a similar situation early before I was using a wiki. Anyway, the one person who contributed the most ended up getting a bit more of the campaign focused on her backstory. Not to reward or punish, but simply because she was offering me material to use in creating the plot. Once the other players realized (by me telling them) that the story was being influenced by the backstory simply because thats all I had to work with, they quickly decided they wanted to guide the story as well. Now I have 2-3 page long backstories. It has been the structural support for the entire campaign since then. Not done of course, since shortly after we took a break from Dark Sun, but I received positive feedback at the table about it. For my high-magic campaign, I’m going to have a much higher rate of reward. When I tried to bribe them using XP it worked for a few sessions until they realized that in comparison to regular XP, the reward was still small. Another DM in the area has had better results but I soon dropped it again as I realized that I cannot instill love using bribes. Now I just make sure to thank anybody who contributes, and I try to make sure any contribution they make has an effect on the game (like medieval mike). In the games where my wife plays, things are much better because she is an obsessive record keeper and takes copious notes. She’ll double check the session reports I write and add stuff I missed. In short, I’m not sure there’s a point in changing how people are. You love the wiki, and they don’t love it as much as you do. Perhaps that’s ok, too? Will see what I can do with that, also been thinking about other things I could do especially if I’m going to try to keep things very story based. Either way whatever I decide on I will have to be careful when introducing it so as to not actually scare them off. This is a really good and insightful way of solving the bribery issues. Thanks for the tip! We’ve used several methods of “Bribing” the PC’s, but the most effective one has been +1 tokens. In between sessions we have an “around the Campfire” email that sums up the adventure thus far, and allows the PC’s to chat, discuss, and rehash, as well as drop some backstory, or ask DM questions in character. If you participate you are rewarded with +1 tokens. (the number of tokens can varry). +1 tokens are used by the player to add +1 to any roll they wish, prior to knowing if the roll was successful. The players have liked the benefit, which isn’t game changing, and it has encouraged out of session participation. We also give out +1 tokens for High Roll Play, and Really cool tactics! So when your character decided to swing on the chandelier to drop on top of the bad guy, instead of just throw something at him. You will more than likely earn a token for cool tactics regardless of the outcome! Generally speaking, I think you can break most players down into two groups: people who really like playing at the table but who don’t spend a lot of time thinking about it between sessions and players who get a little more focused and like to spend their free time doing stuff related to the game. I’ve been playing off and on since the late 1980s and I don’t think there’s any good way to turn one type of player into the other – you’re always going to have people who just want to show up to play and you’re always going to have people who come up with elaborate backstories or notebooks full of ideas and plans. That said, I really love the idea of handing out tokens for minor in-game advantage… If I can get a game of mostly unexperienced players going in the next few months, I’m thinking of adopting something similar – instead of printing off tokens, I might just spray paint washers and hand them out as adventure rewards or whatever – seems like it’d be a little more sturdy than a paper chit and the gamer nerd in me just likes the idea of having a couple mixed in with my dice, rattling around in the ol’ dice bag. A vacuum is the most successful of cleaning resources; it can also be the pricier. There are several different kinds of hoover with several different characteristics. understand what type of vacuum is most appropriate for your requirements. and desire you kind of floors you’ll be employing a hoover on. image of a user in his/her brain that howw a user can understand it. Thus that’s whhy this post is great. Thanks!